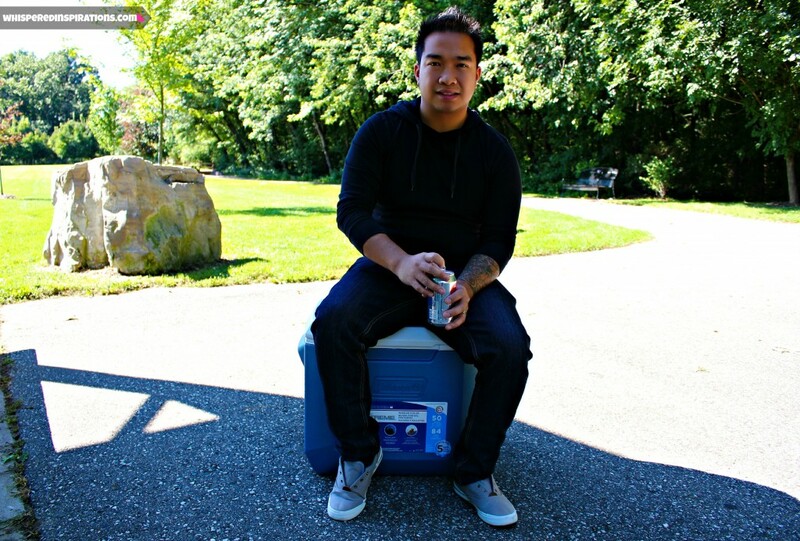 You are here: Home / Giveaway / Picnicking with Coleman: The Coleman 70 Qt. Xtreme Cooler Will Keep Your Ice Frozen for 5 Days & Keep Your Drinks Cool & Food Fresh! Technically, the first day of Autumn this year is September 22nd, with that said, we are enjoying the warm weather and sunshine as much as we can. Some of you may know that we are huge fans of Coleman and it is one of our favorite go-to brands. 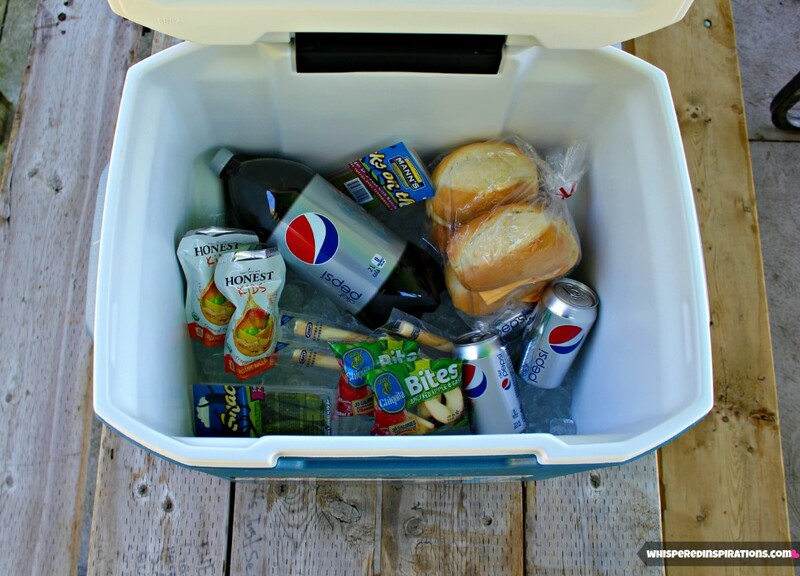 I had the chance to review the Xtreme 5 cooler from Coleman and we were stoked of course. We decided to take a little day trip bright and early with our littlest. We packed a small little picnic lunch, drinks and snacks and we headed out. We filled the cooler with ice and off we went to play in the park and walk some trails. The weather was beautiful and perfect for our little day trip! 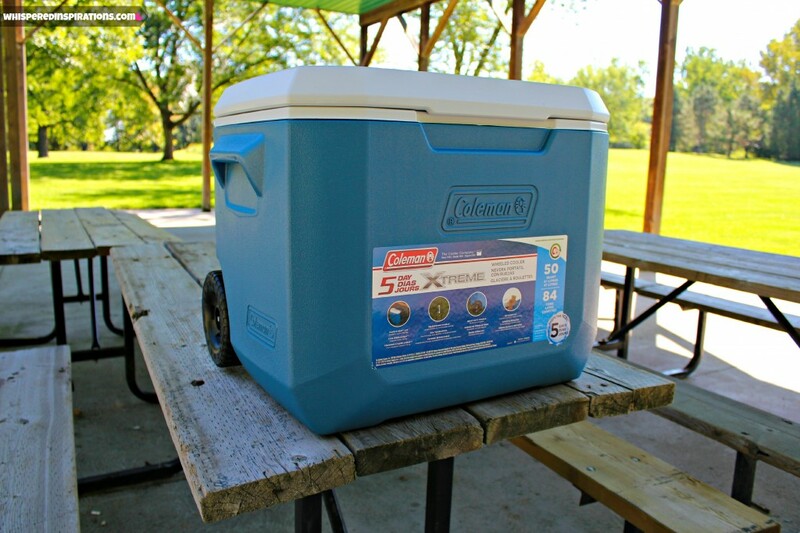 The Xtreme 5 cooler keeps ice for up to 5 days in temperatures up to 32 degrees. Isn’t that amazing? And we put it to the test as we left the ice in the cooler and it DID NOT melt. I was blown away by that alone and not to mention it is 66 litres and can hold up to 100 cans! It’s EZ clean top has a smooth surface for easy and quick washing! The hinged top was useful because with a toddler, you often only have one hand and if you let go of the top, it just closes and doesn’t fall. What I love about this cooler is that it is rustproof, leak-resistant and a channel drain for no-tilt easy draining. Ahhh, you don’t know how amazing that is. If you’re like me, you wait until it drains and then just push the cooler over on it’s side and drain the rest out. This drain works well and it requires no tilting. It is a godsend. I know that we will be putting this cooler to good use for many years to come. You can take one with the Xtreme 5 cooler! 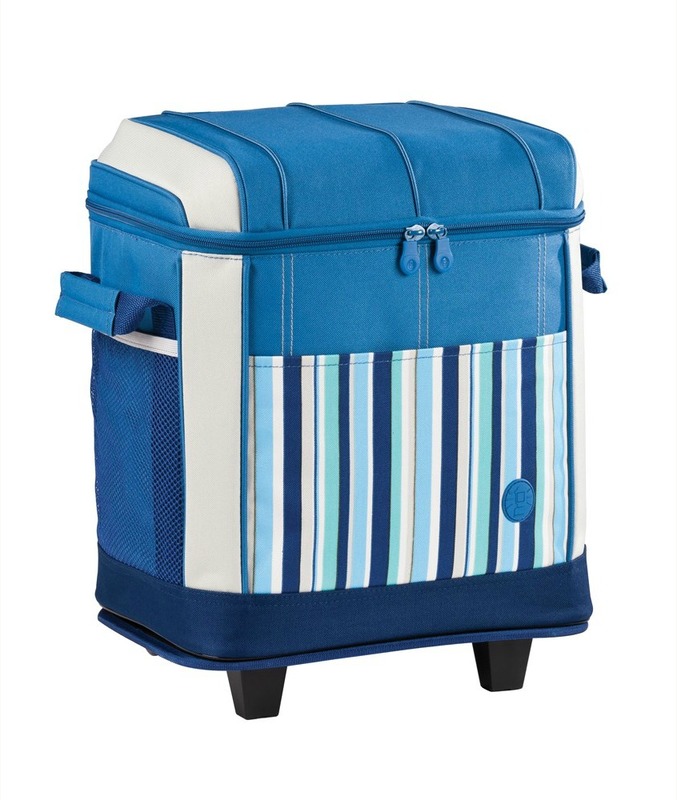 The Have-a-seat lid can hold up to 250 pounds, so if you’re at the beach or at a party and there’s no seating room, you can just relax on the sturdy cooler. This was one of my favorite features and since it holds that much weight, any adult or kiddie can sit when they want. Once you’re done sitting and you need to move the Xtreme 5, the no crush comfort handles makes the job easy. 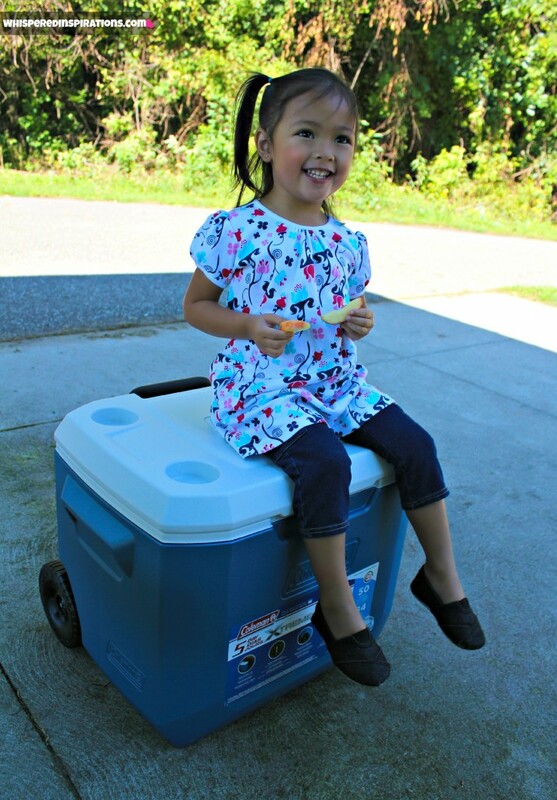 What I loved the most about the cooler is that it has wheels! Apart from all the awesome features I’ve already mentioned, the fact that if I don’t have a big strong man to help me tug this cooler and I can do it myself–well, that speaks a million things! 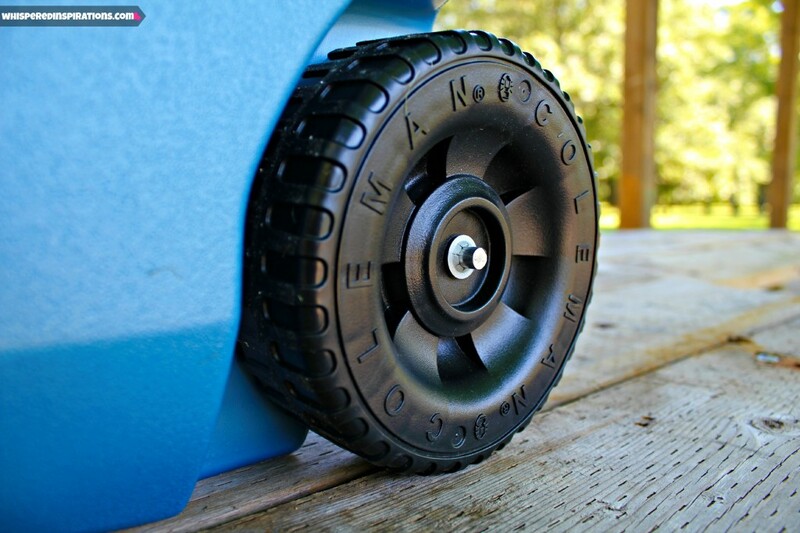 The tires are strong and rugged and can definitely do it’s job and do it well. Now that you’ve seen it rolling, you can see how robust and rugged it is and it’s easy to use. I love how it isn’t only a seat but, it has 4 cup holders that are super handy. Mimi liked it she asked Daddy for a ride, though this isn’t recommended, we thought it was okay to pull her slowly and for a tiny bit. She loved it! So, it’s parent and kid-approved! One lucky CANADIAN Whispered Inspirations reader will win this 50 Can Cooler from Coleman Canada! This giveaway starts on September 4th, 2013 and ends on September 19th, 2013! Open to Canada only! We are going to be using our Xtreme 5 cooler as we make a trip to Toronto. It’s perfect to store the girls snacks and almond milk and juices. They stay cool and hydrated and we save a few bucks when travelling. Make sure to keep an eye out for my next Coleman review where we will be getting outside and active with the Coleman Badminton set! Head on over to the Coleman Canada website to see all the amazing gear that can help you in any season! What would you put in your Coleman cooler? I would store fruit and veg but my sil Mark would use it for beer! Finger foods, drinks, and ice cream. I would pack a picnic lunch in this cooler: potato salad, ham sandwiches, watermelon and chocolate cake! Canadian Cooler. Canadian Beer. Nothing else would do. And of course we would have to have some food. Burgers and dogs. i'm on a specific diet and always bring my own food for road trips – this would be great for my meals. I would fill the cooler with fruit, drinks, cheese, cold cuts for a day at the park. I would put some coolers, beer and ice in my 50 Can Coleman Canada cooler! Homemade hamburgers and buns, salads, cookies and veggies and some water & iced tea! Sandwiches, fruit and some good ole Pepsi!! I would fill it with Dr Pepper! lots of diet coke, water, fruit and veggies, and anything with chocolate so that it won't melt. really great cooler! thanks! I'd fill it with home brewed beer & cherry coke! I would use the cooler for lots of water and juice boxes for my daughter…and I suppose some beer for my husband. Everything we need for a picnic. Hamburgers, hotdogs, buns for both, condiments, salads, fruit and some drinks. I am going to put lots of water, cheeseyoghurt and fruit for our trips to the USA. Would love this to be able to use all summer to store extra items in because my fridge is always full! We live far from the grocery store and need to use coolers to bring home milk and ice cream. We use coolers as expansion space for fresh veggies when we run out of space in our fridge. I would fill it with water and juice bottles and hit the beach! picnic an bbq lunch for my friends, of course! I would put in my frozen groceries when on a shopping trip to Costco which is over an hour away! Definately some near beer, juice, weekend snacks and some amazing steaks to be kept cool until grilling time!!! lots and lots of chocolate for smores for the grandkids! I would love this for all out family’s outdoor adventures. I would put drinks, sandwiches, fruit, snacks and all perishables in Coleman Cooler. The perfect picnic of cold fried chicken, potato salad, watermelon and lemonade would go into the cooler! Lots of yummy food to barbeque, like steaks. 50 cans of course 🙂 ! This sounds awesome!! I'd put drinks, sandwiches, fruit, yogurt, cheese and meat. Sodas for my husband,juice boxes for my children and water for me when we go camping! It would be hard to fit my stuff in around my husbands beer that he would happily fill that nice cooler up with! Juices, soft drinks, veggies and fruits as well as the required ingredients for making sandwiches – usually on baguette breads! Pop and juice for me, a local microbrew for my husband. I'd use the cooler for the steaks and Baileys! I would put Sandwich, cheese, water, fruit and vegies and pop. drinking boxes, pop and sandwiches !! I would put juice, pop, and my favourite camping foods, eggs and bacon. … A ton of Ice Tea !!! We camp and having this cooler would be a huge blessing! On wheels and can fill with plenty of drinks, salads, fruit and the list goes on…Thanks for the chance! I'd have to say that my hubby would probably steal this for his 2/4. Food and drinks for going to the beach! I would load it up with items for camping….mostly juice boxes, some harder stuff for the adults, orange juice…. Sandwiches, some cheese, fruit, soft drinks and of course a few cans of beer! I would put drinks in the cooler. Standard family drinks. Bottled Water, Coca Cola, etc. When we go camping I would put in some hamburgers, fruit, soda, a bottle of wine for me and some beer for hubs. Lots of Steak and beverages!